US President Donald Trump listened to a Quran recitation as part of an inaugural service on Saturday. "O humankind, We have created you a single male and female (Adam and Eve) and made you into nations and tribes and communities, that you may know one another. Really, the most honored of you in the sight of God is the most righteous of you, and God has all knowledge..."
The imam also read a verse from Surah Ar-Rum: "And among the signs of God is the creation of heaven and earth, and the variation in your languages and your colors. Verily, in that are signs for those who know." 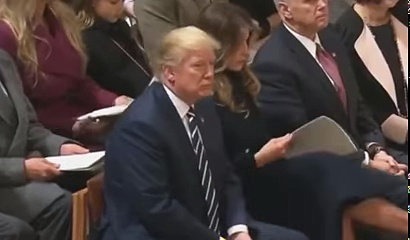 When the imam read the translation, Trump is observed to be nodding his head (see video 0:45) . The imam was among 26 religious leaders from several faiths to participate in the service, reported international media.